Defence news today includes coverage of Remembrance Sunday including a comment piece by General Sir Nick Carter, the Chief of Defence Staff. There is widespread coverage across national and regional print, broadcast and online media as today marks 100 years since the end of the First World War. This includes a vast number of case studies of those who fought in the First World War, striking imagery, recounted stories of battles with entries from soldiers' diaries. The stories covered historians' reflections of 100 years since the end of the war and commented on how people all over the UK will mark Remembrance this weekend. The Sunday Telegraph published a comment piece from General Sir Nick Carter. The piece focuses on the importance of Remembrance Sunday and the need to pass on the lessons of war to the next generation. 'Fallen comrades are always in my thoughts every day of the year, and particularly on Remembrance Sunday. 'It gives us the chance to pay our collective respects to our forebears who fought to uphold our way of life, our values and our freedom of choice. We are the richer for the individual stories of bravery, compassion, determination and tenacity. 'Indeed, I cannot remember a time in my career when Remembrance was more widely observed than it is now. But anniversaries mark the passage of time, and especially so in this Armistice centenary. My generation has grown up with old soldiers who understood the horrors of wars and were determined to avoid it at all costs. But the last of the First World War veterans died nearly a decade ago and we lose veterans of the Second World War each year. As they depart, a new generation not touched so personally by the memory of war, will take responsibility for carrying the torch. 'The challenge is to make sure that the lessons of these wars are not forgotten, not least that we ensure the coming generation understands that the nature of war never changes. 'It is always a clash of wills, it is always visceral and violent, it is always mired in friction that causes the simple things to become seemingly impossible. We might wish to believe that it is unthinkable that we will ever go to war again, but we should remember as Trotsky put it: "You may not be interested in war, but war is interested in you." 'There are times when we need to fight, and by being prepared to fight the war we might have to fight, there is a reasonable chance that we will deter that war from happening. The period of change we are experiencing today, driven by the pervasiveness of information and the rate of technological development, is more sustained than the two World Wars combined. Its rate is increasing. 'Change at this pace and scale inevitably brings instability. In the First World War experimentation, innovation and adaptation were vital in exploiting the new technological developments. We must recreate the innovation and ingenuity seen in wartime, recognising that we will do this better if we do it in partnership with others outside the Armed Forces. 'It is all too easy to take for granted the life we have now. But if we reflect on what our forebears fought for a hundred years ago we will understand the price of freedom. We have made their sacrifice count and we should be rightly proud of what we have today. And our Armed Forces continue to serve to maintain our free and open society. 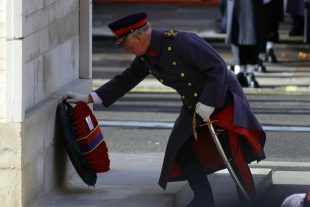 The Prince of Wales lays a wreath during Remembrance Sunday. Her Majesty The Queen and members of the Royal Family joined thousands of people to commemorate the centenary of the end of the First World War today as part of the traditional National Service of Remembrance.